"Sylvester and I were students living in West Bay when we decided to get married. We literally gave Francine a one week notice and she was able to work with us! 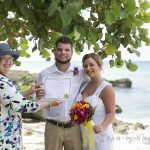 (We were headed back to the states for good and wanted a beach wedding). We probably would have done it sooner, but our names had to be posted in public for 7 days. She married us on the public beach past the 4 way stop in WB on 12-7-05. All of our friends call it the most romantic wedding they have been to. The reception was at Papagallos complete with traditional Cayman wedding cake. " Here are a few pictures from Hayley and Sylvester's wedding. 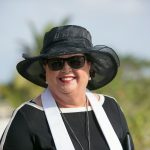 This is my mom, Francine, the doyenne of Cayman Islands' weddings. In 25 years she has performed over 2500 wedding ceremonies. 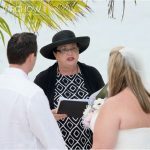 Francine is the "heart" behind Cayman Weddings, everybody in Cayman knows and loves her. 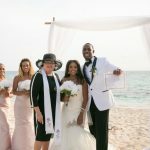 I have heard brides say over and over that having Francine perform their ceremony is the next best thing to having their own mother present!